Repl.it offers a number of features that every user can access and utilize for free. Here, we'll show you how to take advantage of our free features. Everything shown on this post can be done with a free account. Repls are the core of the Repl.it service, and they will always be available for all users. You can create as many repls as you like, and in any language. Start by logging into your account (or signing up for a free account). You can access your repls and create new ones in the "my repls" view, found at the top of your page once logged in. You can create a new repl on this page by clicking on the big green button. You'll be prompted to choose a language - pick any language you like by typing a name in the search, or by browsing the available languages by category. Once you've selected a language, you'll be greeted with your IDE - Integrated Development Environment. 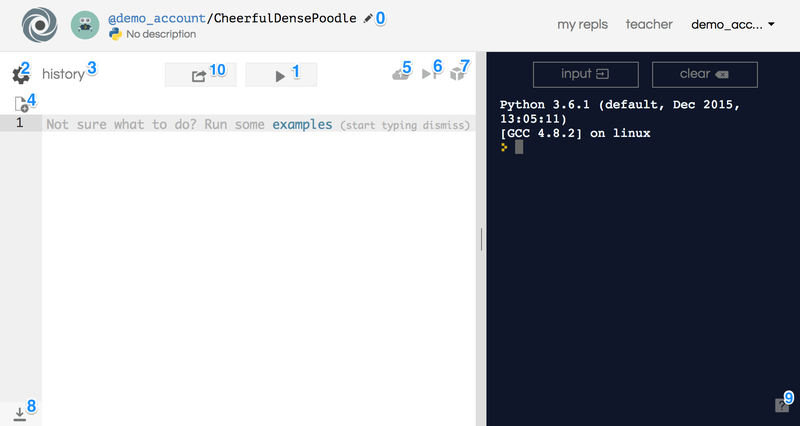 Click on the pencil icon next to the repl name to edit the name and description of the repl. Repls belonging to free accounts are public. Write some code, then click on the "Run" button  to execute your code. The output will be on the right. You an change settings by clicking on the gear icon, and view the edit history by clicking on "history". You can add multiple files to a project by clicking on the "add file" icon. You can download files by clicking on the download icon in the bottom left corner of the screen. Access the help menu by clicking on the question mark in the bottom right corner of the screen. Common editor keyboard shortcuts can be found here. You can also embed repls. Click on the "Share" icon to get a shareable link, links to social media, as well as an <iframe> tag to embed in web pages (HTML). For web projects (HTML/CSS/JS), your project will also be hosted so you can send the website to your friends. You can use it as your homepage, as a proof of concept, or even build it as your startup company. When viewing other people's repls, you can "Fork" the repl to clone it into your account. 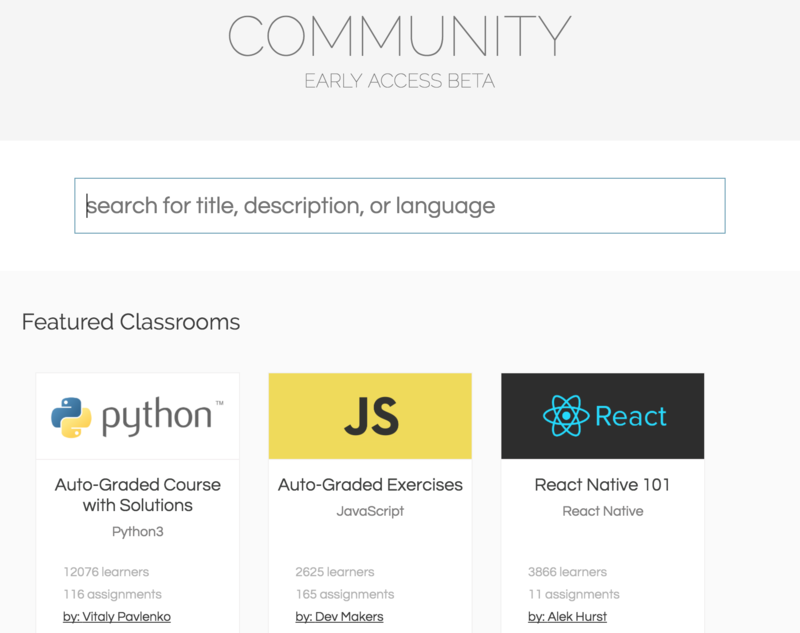 Public classrooms show up under the Community tab at the top of the page. These are classrooms created by other Repl.it users. By clicking on a classroom, you can either "Take and Learn", or "Import and Teach". Clicking on "Take and Learn" will add you as a student to that classroom, where you can work through their exercises. The original creator will not be able to see your submissions, although these classrooms are typically auto-graded through input/output or unit testing. Clicking on "Import and Teach" will clone the classroom into your account, which you can then edit and re-use to teach other students! Free accounts can have up to 200 students per account - past that, please check out our pricing options to see what's most suitable for you. Even with a free account, you can take as many classes as you want. Try it out! You can also create your own classrooms! To enable teacher features, make sure that "Teacher" is checked off under "Roles" in your account settings. This should enable the "teacher" tab, which is where you can manage your classrooms. If you have one student in multiple classrooms, it will only be counted as one student. If you have a student that doesn't submit anything in a month, that student will be considered "inactive" and won't count towards your total (although if they do submit something later, they will count again). You can create as many classrooms as you like under a free account, and in any language. Within classrooms there is no limit on how many assignments you can create, nor is there any limitation on what kind of testing you can utilize.